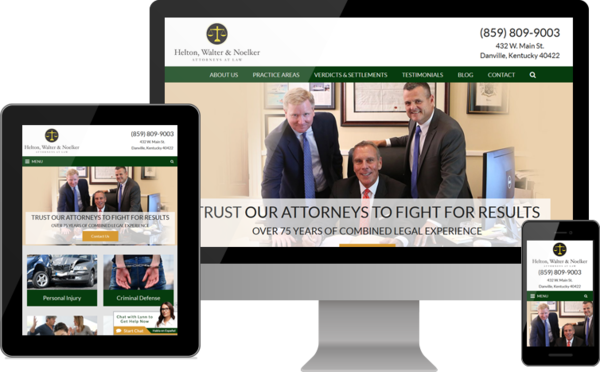 DANVILLE, KY, December 15, 2017 /24-7PressRelease/ — Helton, Walter & Noelker Attorneys at Law announced on Monday that the law firm is now ready to serve clients through its brand new website. The new website design provides potential clients with easy access to information on a variety of case types, as well as the attorneys’ success in many kinds of legal matters. Attorneys at Helton, Walter & Noelker have all achieved significant recoveries for clients hurt in personal injury cases involving car accidents, dog bites, slip-and-fall accidents, defective products, nursing home abuse and more. The verdicts and settlements section of the new website shows some of the awards the attorneys have earned on behalf of clients in these cases. Helton, Walter & Noelker Attorneys at Law is a full-service law firm. In addition to personal injury cases, the firm also assists clients in family law matters such as divorce, child custody and adoption, as well as estate planning and probate. Lawyers at the firm also have experience in complex financial matters. To that end, Helton, Walter & Noelker Attorneys at Law serves clients in real estate closings and transactions for commercial and residential properties, as well as compassionate counsel for clients considering bankruptcy. With a legal team including a former prosecutor for Boyle County and Mercer County, Kentucky, the law firm also defends clients facing a wide range of criminal charges. These include driving under the influence, drug offenses, traffic citations and serious felony charges. Pairing experience, compassion and results, Helton, Walter & Noelker is a full-service law firm serving clients in Danville, Lancaster, Harrodsburg, Stanford and nearby areas in Central Kentucky. With combined experience of more than 75 years, attorneys at the firm represent clients in personal injury, family law, estate planning, criminal defense and bankruptcy cases.